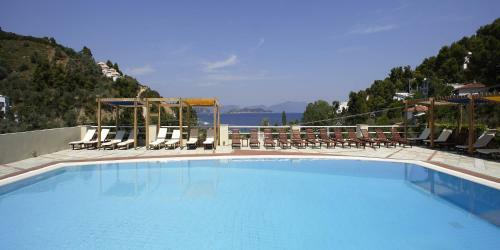 This modern Skiathos hotel is located 80 metres from the beach of Agia Paraskevi. The 3-star hotel features rooms with furnished verandas and has a pool area with sun-lounger terrace, pool and bar. This family-run hotel, nestled on a hillside on the island of Skiathos, is only a short walk from the beach and reflects the colours of the Aegean. Only a short walk from Kanapitsa Bay, easily accessible via boat and bus, Plaza Hotel is set amongst picturesque olive groves and pine trees. Enjoy the tranquil atmosphere while sunbathing on the terrace.